How Often Do You Use Hot Rollers? Even though I think I’m pretty adventurous with hair products and tools (don’t get me started on how I used to flat iron my hair with a real deal IRON), I’ve never used a set of hot rollers. No particular reason why, really. I just never got around to it. But curling irons can take forever to use! I’ve been wearing my hair curly a lot lately, and I want to get back some of the time (20 minutes in some cases) it takes me to curl. That’s why I picked up a set of Jilbere ($35) ceramic hot rollers at Sally Beauty last weekend. I'm a pro and use 'em every day. I'm a hot roller virgin. I'll tell you in the comments! There are 77 comments on this post. Leave yours. I have crazy curly hair so I never considered rollers. However, now that I think about it I wonder if they could help give me more consistent curls and help me get that movie star curly look rather than that crazy cat lady curly look I tend to have otherwise! Please let us know how they work!! I’ll be sure to let you know if these are good. Thanks! I have a penchant for clumsiness so who knows â€¦ hopefully everything will remain intact and burn free. BTW, how long is your hair? My hair is veryyy long.. I try to keep it a little past my bra strap (mid-back) but it grows fast so it is about 3 inches past that. I’ve always had long hair… can’t seem to grow out of it ! .-= Genesis C’s last blog post… GenCuesta: RT @Only1Anderson: #thingsiLIKE Haters, they keep me sharp! =-. Pretty! I like having long hair too, although sometimes I get the urge to chop it off again! I’m a hot roller virgin and proud of it. Don’t think my hair’s long enough for it though (in layers + ends just under my shoulders)! You could probably do it! I bet the jumbo ones would give you some crazy volume, especially with the layers. When I lived in Chicago I used them all the time. They were quick and easy. But now I live in Florida and with the humidity, the curl falls right out. Bummer, because I liked my curly hair. Even using setting spray and hairspray doesn’t help down here. But I think you’ll like them. Damn that humidity! It’s great for skin but a train wreck for hair, LOL! I just bought a set and used them three days in a row. I think I really damaged my hair! I used heat protectant spray one or two of those days, but I think I left the rollers in way too long (when the directions says 10-15 minutes, listen to them!) or had the heat set too high because the next day my hair was looking raggedy in the underlying layers. I’m getting my hair cut to stave off any further damage, like split ends. Eek! Ooh, I have a question for Karen and other commenters. Do you recommend heated rollers or a large barrel curling iron to get beautiful Cosmopolitan-like waves? Which would cause less damage? I’ve only used a large barrel curling ironâ€¦ it works great for big Victoria’s Secret hair, but it takes a looong time. I’ll let you know if these rollers work faster! Anyway, that’s such a bummer about your hair. What brand did you buy? Are the curlers ceramic? Those are supposed to be less damaging. I used Conair Infiniti ionic, ceramic rollers, which gets really great reviews, but it just didn’t turn out well for my hair. I think it was probably because I left them in waaay too long and set the heat a little too high. I’m going to get a new set one day with just jumbo rollers since I have no use for the smaller ones. 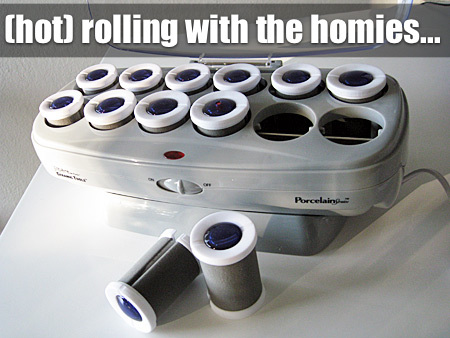 Let us know if your rollers are good or not! The good thing about this Jilbere set is most of the rollers are jumbo-sized. Hot rollers are my best friend! They cut down on blow drying time because I don’t have to get out the round brush and style so dilligently. They’re easy to put in and I rarely burn myself — whereas I burn myself almost every time with the straightener! I also love them in the morning because I roll them on in and leave them to set while doing my make-up and getting ready for work. Lift a section of hair up and roll it all the way down to the root and clip them in. You can change up how tightly or loosely your rolls are too. It can take a bit of trial and error to see what placement is best for individuals haircuts, but all in all, very simple to use, saves so much time and gives great results! I used them all through junior high and high school (curling irons give me cotton hair) but I had a set with little teeny teeth on them and I am sure they did not get as hot as “modern” sets. This was in the early 80’s….. I loved the volume they gave me (curling irons couldn’t do that) and how easy it is to set and forget until they cool and do a quick brush out. Now I use the velcro rollers with metal backs and blast with dryer so I guess it’s a DIY hot roller trick. I have super curly hair, so I’ve never used them on myself (they’d straighten more than curl). I have, however, encouraged my straight-haired friends to give them a try and helped them learn how to use the rollers (not as easy as it looks!). I think they’re great, but even now with my shorter hair, they’d take too long to put in and take out. It’s much less time for me to use my straightening iron to make loose curls where I want them. For the life of me I can’t figure out how to curl with my flat iron. I’ve seen people do it so I know it’s possibleâ€¦ maybe I’m just lacking the proper coordination. Do you think your hair might be too heavy to curl that way? Maybe because of the length… mine didn’t respond well to iron-curls until after the cut. The packing… well, I have boxes now, so that’s good. Pretty much as far as I’ve gotten. How has your Tuesday been so far? LOL, naaw, I suspect I might have funky wrist action or something. Maybe if I worked reeeally hard on the technique I could get there! Packing is not fun. Unpacking — even more not fun. At least you’re on the lesser evil of the spectrum now! My Tuesday has been good. I’ve been feeling the flow lately and have been shockingly productive. I think I should reward myself with some Nutella. Hmm… wasn’t super productive yesterday in terms of my checklist, but did some reading that helped change my perspective about a few things. That and some TV made it a good day. And I hope you went for the Nutella! Yes ma’am! Do you use a spray or some sort of heat protecting lotion beforehand? The last time I had naturally frizz-free hair was when I was, ohhh, eight! I try but for some reason, I can’t get the volume to stay or hold. My mom is a pro though…damn it. Ooh, ask mom for some pointers and then share with the class, LOL! I need all the help I can get. I think curlers would be good for getting that extra volume… and also, I’m horrible with a curling iron (I don’t own one, so perhaps it’s a matter of practice…). Maybe I’ll try curlers or the curling iron sometime. Once you get the hang of the curling iron it’s quite easy… the only thing is it takes so long! Maybe borrow one from a friend for a week and see if you like using it. Sometimes when I’m overzealous with the dryer my hair frizzes like crazy too. Did you use a styling lotion before you blew it dry? Hmm, I don’t remember! It’s been a couple of years. The good thing about my hair is I can just scrunch in some gel and let it air dry, and it looks pretty good. Honestly though, sometimes no matter how much product I use, I’m going to get a fine halo of fly-away frizz! That’s because it’s baby fine. So I try to just avoid the heat, since it makes matters worse! I used to use the Caruso hot steam rollers from back in the day…do they even still sell/make those? They worked really well, as I needed super curly hair during my show choir performance days. Now, I prefer my hair straight so I actually got the Japanese Hair Straightening done, which is good for your hair and keeps it healthy, shiny, and striaght! I love showering, towel drying my hair, and then letting it be free! No more flat irons for me…until my hair grows out that is…hehe. .-= Kajal Couture’s last blog post… Meeeow! A Smoky Cat Eye =-. Oh, that must be nice. My good friend Chris has wash and wear hair that naturally does that. So jealous! .-= keerthamina’s last blog post… notd: illamasqua hectic =-. Hi Karen! Well I’m a hot roller virgin and I think I will be one for a long time. My hair is very thin and won’t stand any challenge. Sometimes after I take a bath and I put lot of volume foam in it, I make a bun and I let it dry like this. It will stay curly for a few hours but I need to sprinkle it with some vitamin water to define curls. The old bun trick is a good one. You know what also works? Sleeping with a loose bun with the hair piled on the top of your head. I’ve never used them before! I’d like to try though. But then I might as well just get a perm- I’ve always wanted one anyway. I hate having straight wavy hair, so bored of it. Hazel! Girl, if you get a perm make sure you go to a stylist you trust. I lived through the late 80s and saw many a perm go dreadfully wrong. I don’t use anything to protect my hair, but I do use a deep conditioner every couple days. Maybe I should step up on that… My hair doesnt look fried? My typical procedure is to section off the hair, and do the front working back. For the curls I want, I have to remember when I section off the hair and start rolling to keep the angle straight out of my head, otherwise they tend not to stay in my hair as well, and it deflates a bit of my root volume. Oh, and I don’t leave them in more than maybe 5 minutes max? I try to do my makeup while the back catches up timewise with the front, but when I do that its usually only eyeliner and blush. So, not that long. I hope that helps a little? And for the record, I think hotrollers are way easier than curlers, but I’ve only curled my hair maybe twice. You should do a review of the hotrollers you bought – I’m on the hunt for a new set! Yup, I’ll review ’em. I just hope I don’t burn my hair off in the process, oy! I use them for special occasions to give my hair really extra volume (mostly for updos or the Victorian kind of curl). My hair takes very grudgingly to the curling iron, but hot rollers make curls stay in for hours. i’m on a no heat in my hair kick right now 🙂 My hair is naturally very curly so when I want big bouncy curls I do Bantu Knots. I learned how to do them from watching some you tube videos. so depending how im feeling that day the bigger the bantu knot the bigger the curl I just put in a leave in conditoner do my knots and the next day I have big bouncy curls. Never tried hot rollers maybe after i get off no heat kick lol!! When I straighten or curl my hair I wear a glove on my left hand which allows me to handle the hair without burning myself. It looks a little ridiculous, but it works really well! I use those cheap stretchy gloves from the dollar store and keep it with my hair products so it’s always on hand. They may seem antiquated, but I used hot rollers all the time when I was a kid (hey, it was the 80s). My mom used them on the regular when I was growing up, and I did a lot of musical theater that required curly hair. I haven’t owned a set of my own in years, but now I’m reconsidering it! The only problem is that it’s harder to control the shape of the curl when use rollers vs. and iron. I’m a hot roller virgin too. I have very fine and thin hair that won’t hold a curl for long, so I never considered using them. .-= gio’s last blog post… Looks: Orange and Red =-. I’ve been wanting to use hot rollers since forever but I’ve just never gotten around to buying a set (and worried about the heat damage of course! ), please please pretty please do a post about your update? :D? .-= teresa’s last blog post… lalaloverly: mMmm. water with lime is making my dayy right now. little things, little things. =-. My mom is the hot roller QUEEN. As a kid, I loved when she did my hair for fancy occasions. I have fine hair, and making sure the rollers didn’t start out too hot was the key: I could leave them in until they were cold, helping the curl stay. I have butch hair now, so it would be impossible, but I used to use them in junior high on the daily. Every morning at like 6 am I would put ’em in, but they were these conair ones that got hella hot and looked like ancient torture tools, and then I would put my hair in a curly pony tail. My sister never understood why I took the time to use hot rollers just to put my hair up in a pony but whatev, I can’t explain my genius to her. I’ve used them maybe twice in my life. I have curly hair so to curl with an iron or rollers I have to straighten it first, which is a lot of work. .-= Kelsey’s last blog post… Beauty Products I’m Currently Using =-. You’ve just inspired me to break my own set out! I actually love using them but sometimes I get out of the habit. They really are easy once you’ve gotten the hang of them and I too love how you can throw them in, do your makeup, and the hair styling is basically done for you. Sometimes I have issues with getting my ends to lay flat in the rollers if I start rolling from the ends. So when I’m having issues with that, I will place the curler in the middle of a section of hair, wrap the ends around, and continue rolling up the rest of the hair to the my head. I’ve also found that my fine hair doesn’t do well with those metal pins that sets often come with so I picked up a huge bag of clips for cheap and sallys and I clip the rollers in that way (the huge clips that will go over the roller and cover it. In my experience, the rollers do not get hot enough to worry about plastic clips melting or anything crazy like that. .-= Megan’s last blog post… A Challenge! =-. OMGosh! I just had my hair in curlers for the first time (okay maybe not THE first time, but its been a long time) today at the salon. After getting my hair dyed Jo, my fab stylist said “lets try these”. Looking like a whacked out pin cushion, I only had these steam rollers in for 5 mins and my already curly-wavy hair came out boinging! We were all laughing cause I looked like Shirley Temple, with fat round curled up tresses. Needless to say, Jo had to calm out my curls with a flat iron. Perhaps I’d use them every once in a while but I don’t need or want to look like I’m one of those irish dancing girls with the bouncing curls again. I use it for special occasions, I don’t use it everyday because I have A LOT of hair compared to other girls D:. Karen, I’ve been reading you via google reader for a couple months and I haven’t commented before but I HAD to say something on this post….I used to use hot rollers to curl my hair every day before school when I was in 8th grade. Every freakin’ day! Sigh…14-year-old me had so much more hair dedication than 24-year-old me. I do still pull them out for special occasions but I’m mostly letting my natural texture run free these days! I know where you’re coming from. It used to take me (gulp) an hour and half to get ready for school; I’m now down to 20 minutes, LOL! Haven’t used them myself yet–well, my mom used them every day and used to put them in my hair when I was a little kid (for fun), but haven’t done it myself. Since my hair is like yours I’m curious to see how you like them. I like to use hot rollers once in a while to save my hair from the heat. I like hot rollers because they are less time consuming. When I use hot rollers I can do my makeup at the same time or do something else. With curling irons I have to stand there and do my hair for up to an hour because my hair is hard to curl. I do like the look of the curls better with a curling iron better than the hot rollers though. Heat protectant sprays – I like John Friedas but also Its a 10. I’ve heard good things about something called Miracle 7 from Sally’s and that is next up to try. Missed you on thanksgiving. Anyway, my younger sister uses hot rollers all the time. When I want curly hair I usually ask her to do it for me, since I don’t have one. I’m not sure what brand she uses, but it totally beats the curling iron. I used to use them all the time when I was in college, but now they are more for special occasions only. I like the way they smooth out my naturally curly (crazy cat lady curly :)) hair into silkier, shinier curls. Maybe I need to dig those curlers out of the closet more often! Forget curlers, I can’t even use a curling iron. I tried once and ruined my friend’s hair. We spoke again later on, but she never let me near her hair again, it was perhaps for the best for both of us. Will still use the hot rollers for work – loved them in college – able to get make-up done , eat breakfast, ready for the day while my hair was in those hot rollers – loved those 80s!!!! I have very long baby fine hair, and I use Caruso steam rollers. I haven’t tried regular hot rollers, but the Caruso does an awesome job at curling my hair. The rollers come in four sizes, and since my hair is so fine, I use the smallest one to get the best curl for me. They are pretty easy to use: spray setting lotion throughout hair, place roller on steam for a few seconds, twist a strand of dry hair, roll it onto the roller, place the steamed outer cap and continue until all the hair is up. It takes me ten minutes to put them in, and I usually only leave them in for ten minutes or so. When I take them off, my hair looks amazing. The best part is they do not damage one’s hair at all! I do this maybe once or twice a month.